Pumpkin is something that really shouldn’t be canned. (Because of the thickness of the puree is hard for it to be pressurized correctly.) But that doesn’t mean you can’t preserve it! The safer alternative to canning pumpkin is freezing it! It’s pretty easy, there are only a few steps. Wash off the pumpkins. You don’t need to do a heavy scrubbing, just get the dirt off the outsides. Cut the pumpkins in half. 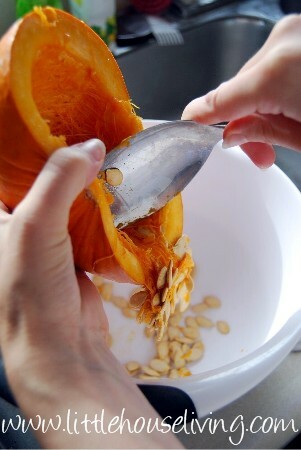 Scoop out the “guts” of each pumpkin. make sure you don’t scoop out any of the meat, just clean out the stringy stuff and the seeds. Don’t throw these away! 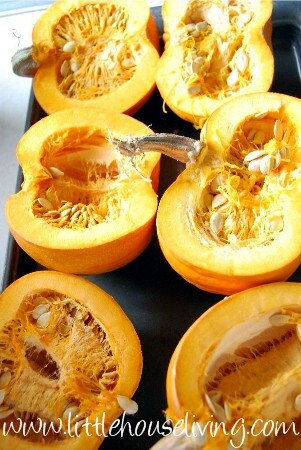 Make Dried Pumpkin Seeds! 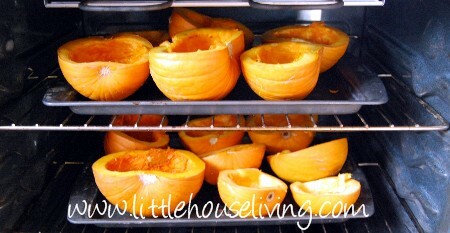 Put the cleaned out halves of the pumpkin in the oven at about 375F. Cook them until the pass the “Potato doneness test” poke the meat with a fork and wait until it feels like a cooked potato. 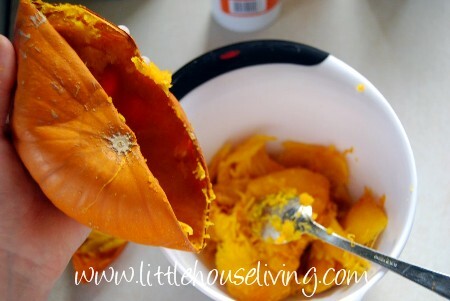 A fully cooked pumpkin should clean out really easily. You can almost peel the skin right off. Put all the meat into a bowl. Stick the meat in a food processor and add a little water. 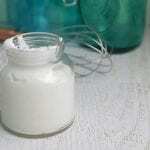 Process it in small batches and it will work better. The water will help the pumpkin puree better. The consistency should be like baby food. 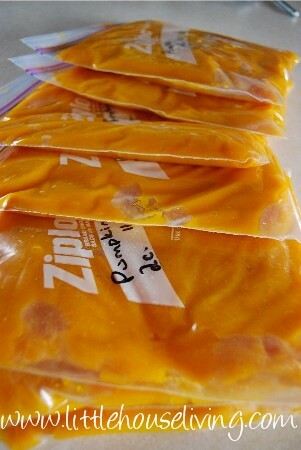 Put about 2 cups of pumpkin in each freezer bag and label. 2 cups should be close to one can of store boughten pumpkin so you can easily use each bag in exchange for a can in a recipe. 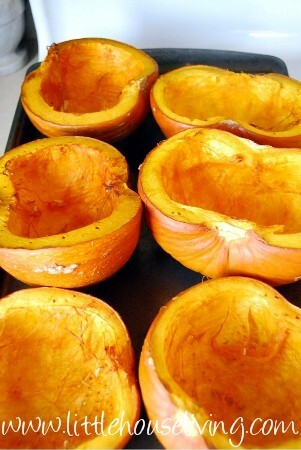 Flatten out each bag of pumpkin as you lay it in the freezer so it freezes flat. 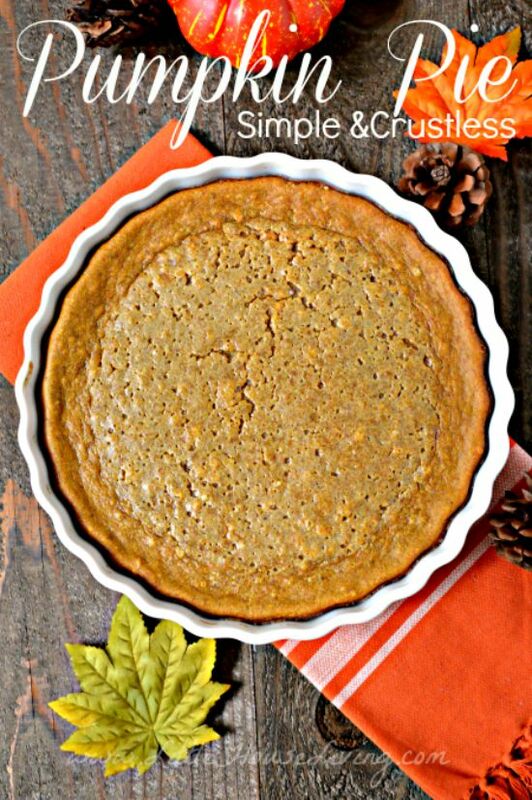 I used my frozen pumpkin in several recipes including: Pumpkin Muffins, Pumpkin Pie in a Jar, Pumpkin Turtle Cheesecake, and my favorite, Pumpkin Whoopie Pies! 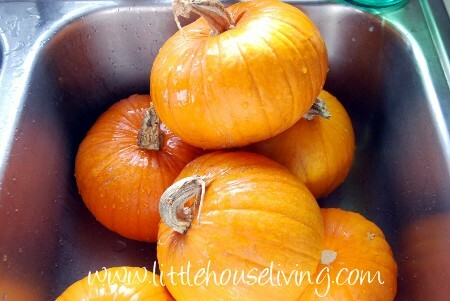 Have you ever tried preserving pumpkin? How much do you generally try and put away each year? Okay I will say it again you are so smartttttttttt !!!!! You also must have time to do these things without being interupted by others, My hat is off to you, you teach me so much. I do this every year and using this to make pumpkin pies is soooo much tastier than the store-bought stuff. 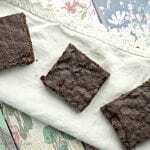 I use the same freezer bag method for pie sized servings but I also make a few quart sized bags with 1/2 cup each in them so I can use it for things like making a batch of pumpkin whoopie cookies, pumpkin pancakes, or my favorite is to mix it with some cool whip and some spices for a yummy and healthy dip! I can pumpkin every year for my family of 14 and we’ve never gotten sick. I will say that if you find a can that the lid has popped on, you won’t find a worse smell! But we can quarts and quarts of pumpkin every year (a local farmer lets me glean in his field after Halloween), use it to make pies, muffins, cookies, etc, and never had any problem. I have frozen it in the past, but my goal is to can as much as I can to save freezer space. Also, if we lose power for several days, I won’t lose my canned food. I would like to respectively disagree with you on your canning pumpkin comment. Canning it doesnt produce bacteria and you can search the internet over & you will not find that comment in any professional forum or statement. I do agree with you that it is advised by the USDA to NOT can pumpkin puree but that is because that is because there is no way to regulate the thickness and viscosity of the puree of the product being canned and no way to actually test it (USDA or anyone else) to determine whether or not the center of the jar gets hot enough, long enough to kill any botulism spores should there be any in the pumpkin. 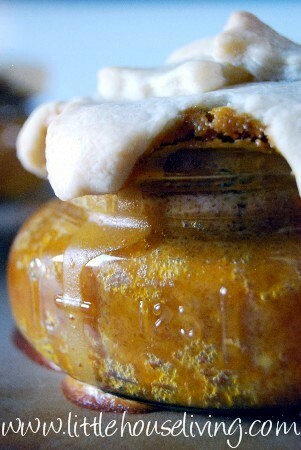 The USDA does give guidelines for canning chunk winter squash & pumpkin, just not purees. Saying that.. I make pumpkin butter & its not recommended to be canned either.. but I do and we’ve never gotten sick nor has any ever been bad. I pressure can mine (half pints & pints) for 90 minutes just to be on the safer side. I would do the same thing with plain pumpkin if I were going to can it. I have frozen pumpkin puree lots of times, but several years ago I had an abundance of pumpkins and I wanted to can some I only did it in pints and I did it for 90 minutes at 10 lbs pressure. It turned out great I didn’t fill the jars to the top, I left plenty of head space for the heat to penetrate through and through. It was very easy, tasty, and fast when I wanted to do a bit of baking. I’m a true country gal and I have been canning everything I can for years now. 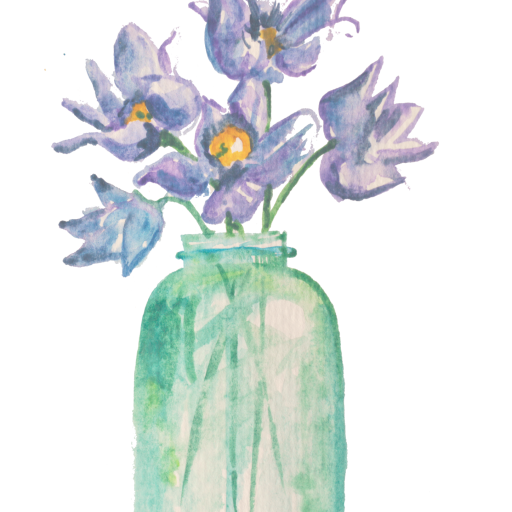 I LOVE your blog thanks again. I freeze pumpkin puree in ice cube trays. This way I can grab a couple of cubes to thaw whenever I need to, without having to thaw a large bag. 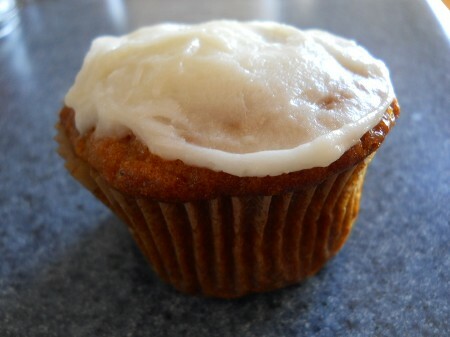 I like to sneak pumpkin puree into muffins, pancakes, brownies, spaghetti sauce, and more. Having it frozen in cubes makes it so easy to do – just don’t tell my kids! In addition to freezing pumpkin, I freeze my persimmon puree. I measure out the amount that I use in my persimmon pudding and put it in freezor bags, squeeze out the air and lay flat to freeze. Wonderful winter treat. I find that it helps to drain the pumpkin through a fine strainer or cheesecloth before freezing. It comes out less runny when thawed and takers up less room in the freezer. My fresh veggie market had their pie pumpkins 3 or 4 for a dollar in early October. They have been decorating my porch table since then. This week I’m baking them all to be used for pies, muffins, bars, and cakes–all incredibly tasty and totally vegan. 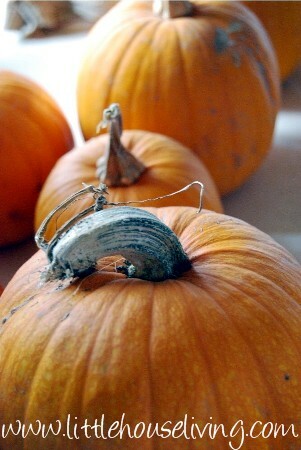 I should have enough pumpkin to last thru the holidays for our large family. What a thrifty deal! I freeze my pumpkin by two cups in small zip bags. Then to thaw it, I cut a hole in one corner and drape over a cup to drain out the excess water. We don’t use commercially canned foods, so this is a great alternative. Mmmm Pumpkin! I don’t think I could ever preserve it because I would eat it too quickly, LOL! 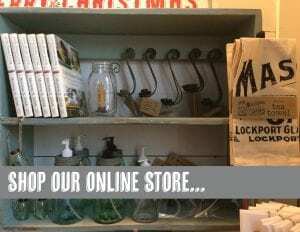 Yes for preserving your own food! 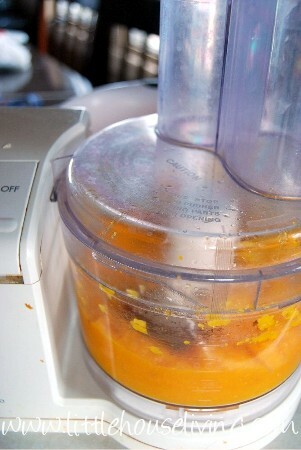 I tried preserving pumpkin before but didn’t puree it in a food processor. I’ll have to remember to put it in the food processor next time. 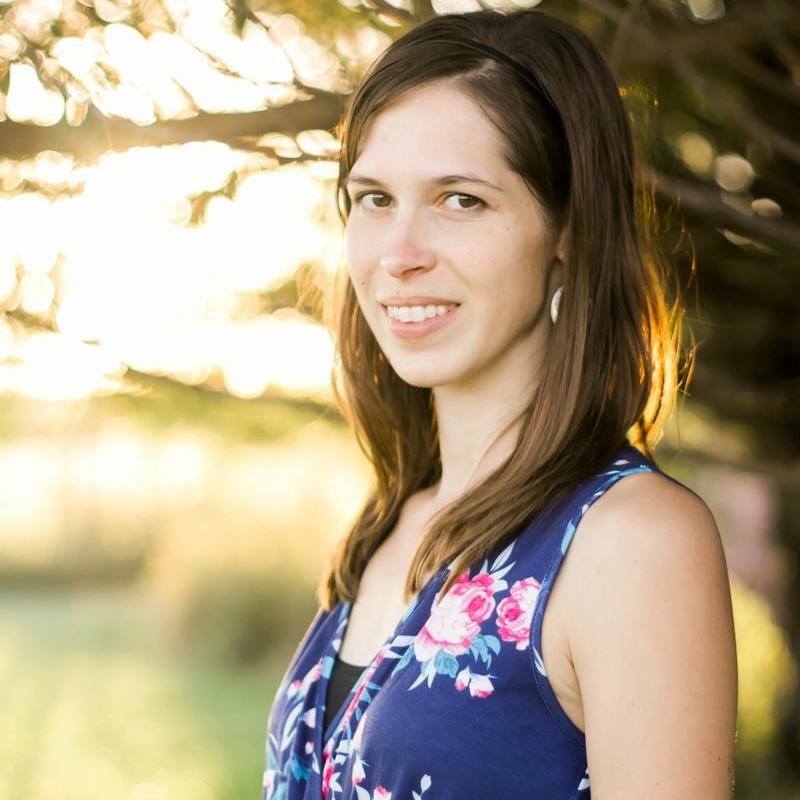 Thanks for linking up to Gingerly Made! Just wondering if you have tried this with butternut squash, this year I seem to be having all the luck with this growing. I have never tasted one before but I read they are similar to pumpkin. I think I would cube butternut squash instead of puree it. Unless of course, you use it pureed 🙂 I haven’t frozen butternut squash because I like to keep it in cold storage but I’m sure it would work just like pumpkin. the seeds are cooking in the oven as I write this. Thanks a Bunch ! Question, how long will my sweet potato pie filling keep in the freezer? Today is the 15th and I’m baking on the 24th. I actually use a fork first when cleaning the inside. It allows me to “comb” out the seeds without all the stringy pulp. Then I scoop out the pulp from there separately. Works great and less hassle.